This is a sheet i made where students can interactively talk to each other, describe the other members of the class using adjectives and then have the fun of seeing if the words match the people's characteristics. What you can also do is some of the characteristics are blank, you can simply make them happen to match the students star sign...keeps it more interesting for them, as I am a middle school teacher and anything that keeps their attention AND using English is good! 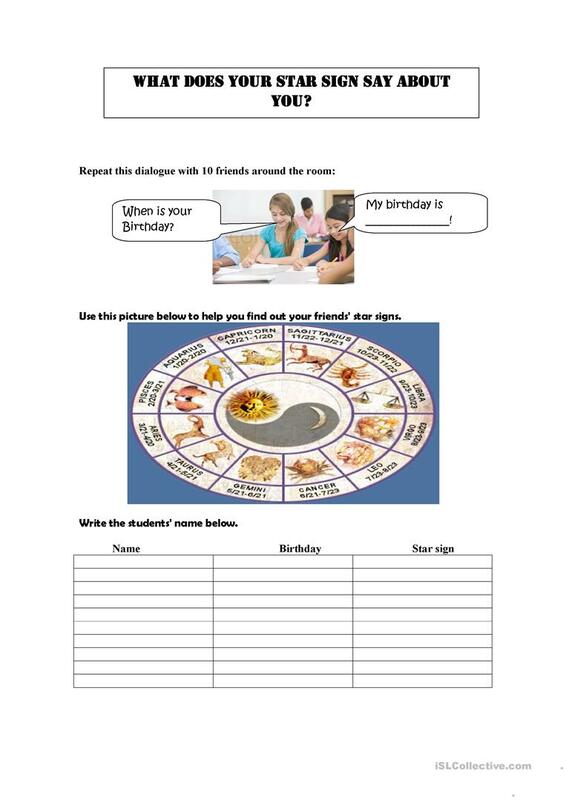 The present downloadable printable is intended for high school students and elementary school students at Elementary (A1) and Pre-intermediate (A2) level. It is valuable for consolidating Adjectives and Adjectives to describe personality and character in English, and is a valuable material for honing your students' Speaking and Reading skills. It features the theme of Describing people. allantj is from/lives in South Korea and has been a member of iSLCollective since 2011-09-23 04:11:13. allantj last logged in on 2012-05-01 08:28:22, and has shared 1 resources on iSLCollective so far.